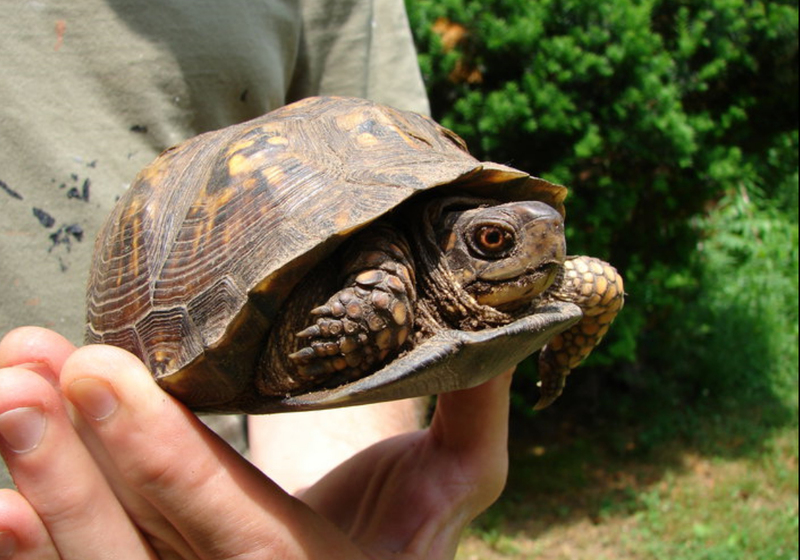 Please document any Eastern box Turtle sighting for CTDEEP; photograph the upper and undershell, and also the habitat. Note note the date and location. The DEEP reporting form can be downloaded from the Endangered Species Section of the DEEP Website. The Turtle Crossing Program of the Quinnipiac River Watershed Association compiles turtle records from central Connecticut, for CTDEEP. We also educate citizens on conservation of the remaining Eastern box turtle populations, and erect “Turtle Crossing” signs, as road kill is a major cause of death. For sightings south of Meriden, please e-mail debwhoplays@gmail.com; for Meriden & points north, e-mail sigrun.gadwa@sbcglobal.net. If you happen to live in an area, which still has this declining species, be especially alert while mowing. Mower operators should be familiar with box turtles. Refer to photos of color and pattern variations, such as yellow, orange , tan, or mostly dark (small designs). Photos are on-line. Avoid mowing when temperatures are pleasant; instead mow when weather is hot and dry, when turtles are likely to be resting in the in the shady edges of fields or under shrubs, rather than in a hot, open area. In summer, the highest risk period is the morning hours when there is still dew on the ground. During the hot, dry conditions typical of midday, turtles usually rest in the shade. During prolonged hot, dry spells, turtles often aestivate (bury themselves and become dormant) underground. Brush hog field edges or managed open habitat in the mid to late winter, when ground is frozen or relatively dry. Turtles hibernate underground during winter months. When closer mowing (lower than 6-8 inches) is unavoidable, we recommend these precautions: Use a hand-held string trimmer, which would not injure a turtle fully within its shell. For larger areas, have someone walk in front of the mower to check for box turtles. Any turtles found should be moved several hundred feet out of the way. Do not relocate turtles off site. Leave strips or “islands” that are infrequently cut, such as a 3 to 8-foot wide swath of meadow or shrubs between the lawn and the woods edge; beds of shrubs and perennial wildflowers with wood chips; or a meadow-wildflower patch. Turtles will spend more of their time in these areas, feeding on insects and worms, than in the open lawn or field, and they improve the overall habitat quality. Woodchips are a preferred refuge in the heat of the day. Avoid broadcast pesticide use in these areas. Note that fields over three acres in size are likely to support nesting by rare and/or declining grassland birds species. These are best protected by not mowing at all from May 15th to August 15th . Developed for the Quinnipiac River Watershed Association’s Turtle Crossing Project by ecologist Sigrun N. Gadwa of Carya Ecological Services, LLC, Cheshire, Connecticut. Advice provided by Dan Rosenblatt, Regional Wildlife Manager for State-owned Lands in Long Island, Stony Brook office of the New York State Department of Environmental Conservation; herpetologist Hank Gruner; professional mower James Hutchinson of East Haddam; Blake Wilson of Ships Hole farm, Smithtown, Long Island, NY, and others. Photos by Tony Ianello. Layout of first edition by Illisa Kelman. January 2007. Revised June 2013. This entry was posted in Native Landscaping, Wildlife Habitat. Bookmark the permalink.